Altreonic has delivered a KURT-H1 e-vehicle to the University Hospital of Leuven (Campus Gasthuisberg), the largest hospital in Belgium with more than 9000 employees, over 2000 available beds and 4000 visitors a day. Responding to the need of transporting both patients and visitors in a timely and safe manner, the KURT-H1 is capable of simultaneously transporting one person in a wheelchair, two passengers and the driver. The KURT-H1 vehicle only measures 103 cm wide by 160 cm long. The Altreonic team sought in cooperation with the hospital for the best solution in a challenging setting. 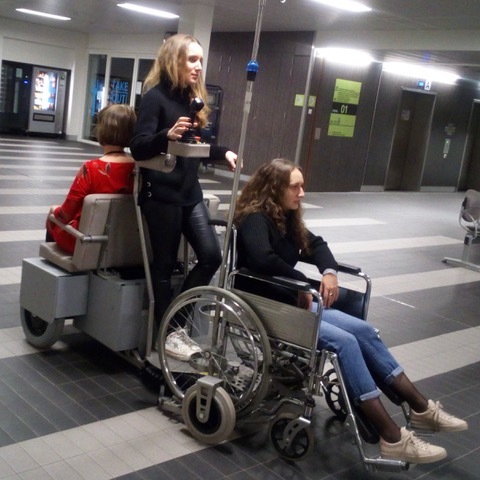 Wheelchairs are very divergent, elevators and corridors can be narrow and have tight corners. The KURT-H1 project at UZ Leuven was able to demonstrate the benefits of the modular and flexible KURT-concept for e-vehicles. Altreonic is able to adapt the KURT concept to a wide range of settings and capabilities. The KURT-H1 is a lot of vehicle in a small package.